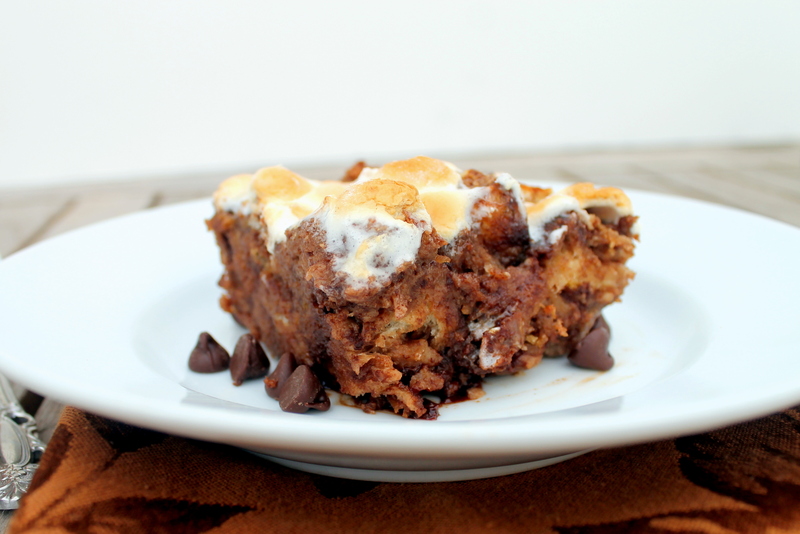 This S’mores Bread Pudding is a soft, decadent dessert or brunch treat that will remind you of your favorite campfire dessert! So, I just began writing a post for a different chocolate week treat. Two paragraphs in, I clicked on Facebook and saw a post for S’mores Cookies and a title exclaiming “Happy S’mores Day!”. Um, how was I unaware that August 10th is S’mores Day? Good thing for me, I had a s’mores recipe all lined up for tomorrow so the order got a quick switch-a-roo and here we are: a s’mores recipe right in line with the days festivities. S’mores are such a classic. Whoever thought to toast a marshmallow – genius in itself – and then sandwich it in between graham crackers and chocolate seriously had some brains. The flavor combination is just so darn good and exemplifies American summers at their finest. What’s a summer without a camping trip and roasting s’mores over an open flame? Theirs just nothing like it. However, sometimes we can’t all find the time to search out a fire pit to make s’mores over. That is where s’mores inspired treats come in. The same flavor combination of s’mores, just applied in a different format. S’mores bars, s’mores cookies, s’mores pie…it all ran through my head when deciding what s’mores dessert I should do for chocolate week. bread pudding, or heard of s’mores bread pudding, I knew that’s what I was making. Hellooo? It sounds phenomenal. 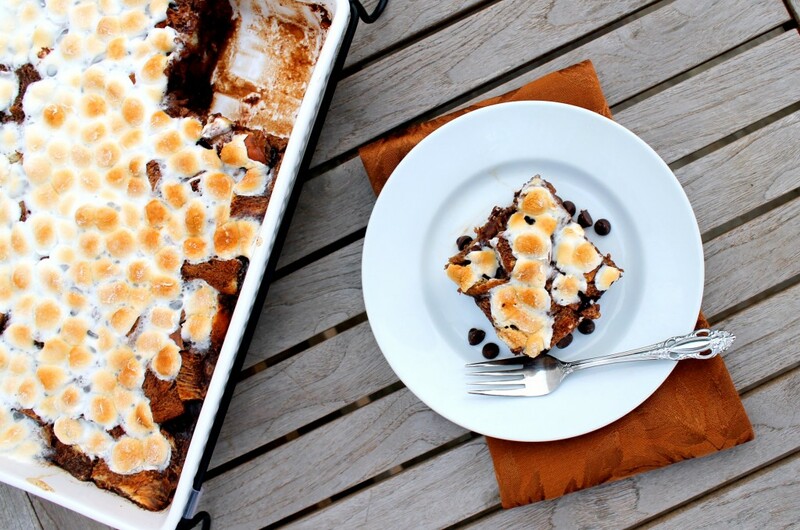 A quick Google showed that everyone who made s’mores bread pudding just added chocolate, graham crackers and marshmallows into normal bread pudding. I decided I was definitely making a chocolate custard, adding tons and tons of graham crackers and chocolate chips, and topping it with toasted marshmallows. Oh yeah. It was a really good idea. 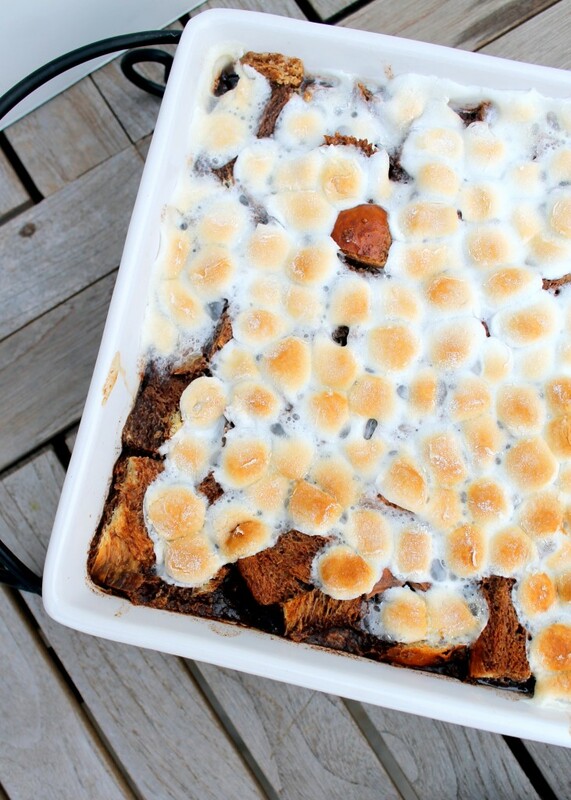 Even if you do have time to make the real thing, make some s’mores bread pudding. It’s soft, sweet, chocolatey, sticky, and totally reminiscent of those childhood summers you spent at a bonfire on the beach. Here’s to my new favorite holiday! Happy S’mores Day! Have a 9-by-13-inch baking pan at hand (a Pyrex pan is perfect here), as well as a roasting pan big enough to hold the baking pan in hot water. Line the roasting pan with a double thickness of paper towels. Cut the bread into 1-inch cubes. If the bread is stale, put it into the baking pan. If it is not stale, spread it out on a baking sheet lined with parchment or a silicone mat and bake in a 350°F (175°C) oven to “stale” it for 10 minutes, then toss into the pan with the milk chocolate chips and graham crackers. Bring the milk and cream just to a boil. Fill a teakettle with water and put it on to boil; when the water boils, turn off the heat. Meanwhile, whisk the eggs, yolks, and sugar together in a bowl. Still whisking, slowly drizzle in about one quarter of the hot milk mixture — this will temper, or warm, the eggs so they don’t curdle. Whisking all the while, slowly pour in the rest of the hot milk. Add the bittersweet chocolate and whisk it in gently until it is melted and the custard is smooth. Rap the bowl against the counter to pop any bubbles that might have formed, then pour the custard over the bread and press the bread gently with the back of a spoon to help cover it with liquid. Leave the pan on the counter, giving the bread the back-of-the-spoon treatment now and then, for 30 minutes. Center a rack in the oven and preheat the oven to 350°F (175°C). Put the baking dish holding the unbaked pudding into the roasting pan, and then slide the pan setup into the oven and very carefully pour enough hot water into the roasting pan to come halfway up the sides of the pudding pan. Bake for 35 to 45 minutes, or until the pudding is uniformly puffed, the top is dull and dry and a thin knife inserted deep into the center comes out clean. If you have a kitchen torch, remove pan from the oven and transfer the baking pan to a rack. Top evenly with marshmallows and using the kitchen torch, brown the marshmallows. If you don't have a kitchen torch, keep the pan in the oven and set it to broil. Spread the marshmallows on top and let broil for about 3 minutes, or until the marshmallows are browned. Remove from oven and roasting pan and cool to room temperature. You could serve this pudding warm, but it is better at cool room temperature or even chilled — it also cuts better when it is cold. Serve the pudding simply plain or with chocolate sauce, marshmallow creme, or even whipped cream. Enjoy! 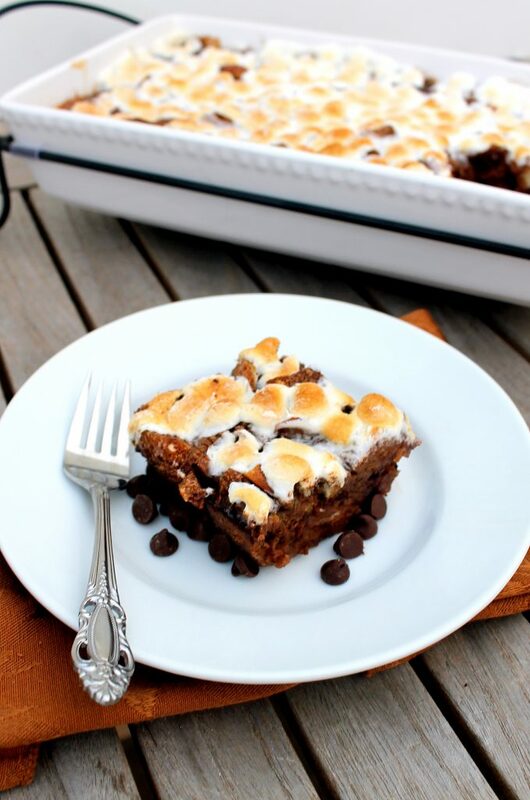 I love bread pudding and this s’more variety looks so delicious. We always have bread pudding at the holidays in our family, but I can’t wait that long to try it. I will be making this soon!